For other uses, see Dongying District and Dongyin, Lienchiang. 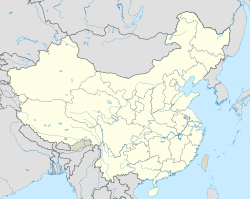 Dongying (simplified Chinese: 东营; traditional Chinese: 東營; pinyin: Dōngyíng), a prefecture-level city, lies on the northern (Bohai Sea) coast of Shandong province, People's Republic of China. At the 2010 census, 2,035,338 people resided within its administrative area of 7,923.26 km2 (3,059.19 sq mi) and 998,968 in the built-up area made up of Dongying district and Kenli County largely being urbanized. Dongying is home to the Shengli Oilfield which after the Daqing oilfield is the second largest oilfield in China. These are further divided into 43 township-level divisions, including 23 towns, 13 townships and 7 subdistricts. The city was established in 1983, as a base for developing the Yellow River Delta and China's second largest oilfield, Shengli Field. The oilfield was discovered in 1964 near a small village called Dongying, which gave its name to the city. The city is located at 36° 55'–38° 10' N latitude and 118° 07′–119° 10' E longitude, and has a total area of 7,923 square kilometres (3,059 sq mi). The city's 350 km (220 mi) coastline borders Laizhou Bay and Bohai Bay to the east and north respectively. Dongying has a monsoon-influenced, four-season humid continental climate Köppen Dwa), with hot, humid summers, and cold but dry winters. The city is dry and nearly rainless in spring, hot and rainy in summer, crisp in autumn and dry and cold (with little snow) in winter. The average annual temperature is 13.1 °C (55.6 °F), and the annual precipitation is 559 millimetres (22.0 in), with a strong summer maximum, and high variability from year to year. January is the coldest and driest month, with a mean temperature of −2.6 °C (27.3 °F) and 5.5 mm (0.22 in) of equivalent rainfall. July is the hottest and wettest month; the corresponding numbers are 26.8 °C (80.2 °F), and 168.8 mm (6.65 in). A large part of the city's economy revolves around petroleum and the nearby Shengli Oil Field. Industries include petroleum, petrochemistry, saline chemistry, papermaking, machinery, electronics, construction, building materials, foodstuff processing, pneumatic tires and rubber, textiles, and light industries. Dongying is one of the world's leading producers of rubber tires. It has more tire factories than any other city in the world. Recently, Dongying's economy has grown significantly, reflecting the high development of China's economy. The city's growing manufacturing sector and its proximity to oil reserves have led to increased company investments. An example is DuPont, which invested 5 billion yuan in 2005 to build a titanium dioxide factory in the area. After this project's completion, it became the largest investment outside of the US for DuPont. A new bus station (东营市汽车总站; Dōngyíng Shì qìchē Zǒng Zhàn) was built between the east and west sides of the city, on Huanghe Road (黄河路; Huánghé Lù). Connections to Beijing, Qingdao and Jinan, among many other cities are available on a daily basis. Dongying is home to one major university, the China University of Petroleum, as well as several colleges and technical schools. There are also many top high schools located in Dongying, one of those is Shengli Oilfield No.1 Middle School. Founded in 1965, rated as the most successful middle and high schools in China in a research hold by Beijing University in 2014, it is the first provincial standardized school in Shandong Province. There are 114 classes in the school with more than 5,300 students. There was an explosion that occurred at a chemical factory starting on Monday, 31 August 2015. One person died and several were detained by authorities. ^ a b 东营市第六次全国人口普查主要数据公报. Dongying Bureau of Statistics. Retrieved 27 July 2012. ^ a b "Geographical Location". Dongying municipal government. Archived from the original on 18 May 2011. Retrieved 27 July 2012. Wikivoyage has a travel guide for Dongying. Wikimedia Commons has media related to Dongying.